What I learned from this experience is that lounge life isn't as simple as showing up and preparing to be pampered. 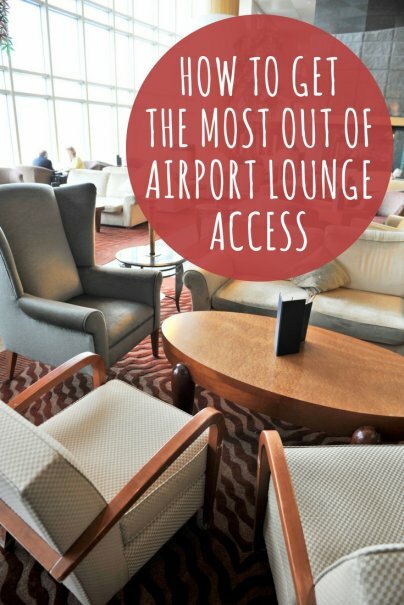 You have to keep a thing or two in mind to make the most of your lounge access. Some lounges require that you bring the credit card that qualifies you plus an ID, while others, like Priority Pass, will want to see your membership card. (Most lounges will also accept the digital version of the card on your phone.) You usually also need to show your boarding pass. Even with the right credentials, note that not all lounge access programs get you in free. Some, like the basic Priority Pass membership, simply affords you the opportunity to enter participating lounges for a fee. Others simply offer a discount. The first time I flew with my fancy-schmancy credit card, I was excited to see that the company had just opened a new lounge at my airport. I was less excited when I found out that I could only bring in two guests, which was awkward since I was traveling with my three children. It wasn't exactly Sophie's Choice, but there was some bitterness afterward from my teen, who was left at a cafe outside the lounge for about half an hour while the rest of us checked the place out and stuffed our faces with fresh-baked cookies. Since the lounge I visited was operated by a credit card I held, the staff were able to tell me exactly how many people I was allowed to bring in. But beware: Both individual lounges and lounge membership programs vary on how many guests are allowed, and the staff at the lounge may not know the details of your plan. What this means is that if you show up with a guest and your Priority Pass card, for example, you'll both be admitted, but your credit card might be billed an entrance fee for the guest later. Airports are big places, and sometimes sheer distance could keep you from enjoying the lounge. Last time I flew out of San Francisco Airport, I had access to the Air France/KLM lounge, but I couldn't visit it because that lounge is in the international terminal and I was flying domestic. There is a secure passageway between the international and domestic terminals, but I didn't arrive early enough to cover all that ground. Another time, I wanted to visit a particular lounge on a layover, but the lounge and our gate were separated by a nonsecure area, meaning that we would have to pass through security in order to get back to our gate. With only an hour layover, that was a chance I couldn't take. Of course, even if the lounge is far from your gate, you should be able to take advantage of it if you budget enough time. You should also factor in activities that are available in the lounge, into your time budget. While a lot of lounges' main offerings are food, drink, workspaces, and Wi-Fi, some have showers, sleep suites, spa services, and even entertainment such as pool tables or a putting green. One good resource for figuring out the amenities your lounge has is LoungeBuddy, which has a website and mobile app full of lounge info. Travelers love sharing photos of airport lounge food. From Facebook, I know that some lounges leave tired travelers hungry, while others provide meals so good that first class passengers end up skipping the gourmet meals onboard. Check LoungeBuddy or other online reviews before you go to figure out if you should expect a full meal from your lounge or just a snack. This confused me at first, but my credit card app lists some locations as lounges that look like ordinary restaurants or bars. Here's the deal: Some lounge programs have partnered with eateries to provide members with a credit toward food and drink — effectively converting the restaurant into a lounge. For instance, Priority Pass members can get $28 worth of free food and drink from seven different establishments in the Sydney airport. Some lounges post dress codes; Swissport Executive Lounges, for example, bans tracksuits and baseball caps. Other common rules include no outside food and drink, no sleeping in the seats, and no smoking. You might be allowed to bring your pet in — but your pup or cat probably won't be allowed to sit in a chair. In the first lounge I ever visited, there was a price list behind the bar. At first I thought this meant I had to pay for any cocktail, so I got out my card when ordering a bloody mary. However, the bartender kindly explained that only the premium liquors cost money in this particular lounge; if I ordered my drink with a well liquor, it would be free. Naturally, I wanted to tip the bartender who had clued me in on how the bar worked, but embarrassingly, I had to borrow two dollars from my little daughter to do so. Next time, I'll bring small bills for tipping the bartender. Some lounges have self-service bars, eliminating the issue.